Dr. Loren Pickart, 7% GHK-CU ACCELERANT- Extra Strength Booster. Level Strongest. You will find GHK to be gentler than the copper peptides we have carried for years. It is more gentle, but that does not mean that it doesn't work as well. This is actually the strongest copper product that Dr. Pickart creates. In his level chart of 1-28, this rates in at a 36! When we say Extra Strength - we mean it! You may actually SEE the copper sediment floating around in your bottle. This is perfectly normal. There is nothing wrong with the product because of this. It is natural. This amazing booster product is meant to be added into ANY other product* that you use daily to give it a copper peptide KICK! How many drops are in the GHK-7 Accelerant? There are about 400 drops in the 15ml bottle. Each drop will give about 3.3mg of the peptide. You will receive 1 gram (1000 mg) of GHK-7 in this bottle *mixed in an aqueous solution. We have made it very easy for you to figure out how many drops you need to add into your favorite creams and serums to get exactly what you would like. *There are a few exceptions though for use, so keep reading. **Feel free to start with LESS DROPS of the peptide if you have more sensitive skin. Then, you may build up to these percentages as you move forward with your skin regeneration. Another option would be to create one of the stronger percentages in our chart, but only use this every other day or every third day until your skin feels comfortable. Do not add GHK-7 to Vitamin C products. Do not add GHK-7 to, or apply it at the same exact time as hydroxy acids. *Use the second generation copper if you need to do that. CP Serum, Super CP Serum or SuperCop 2x, or simply apply them at different times of day. Do not add GHK-7 to VIP Lux Eye Cream. Do not add GHK-7 into Zinc SPF creams. All other products will work fine. 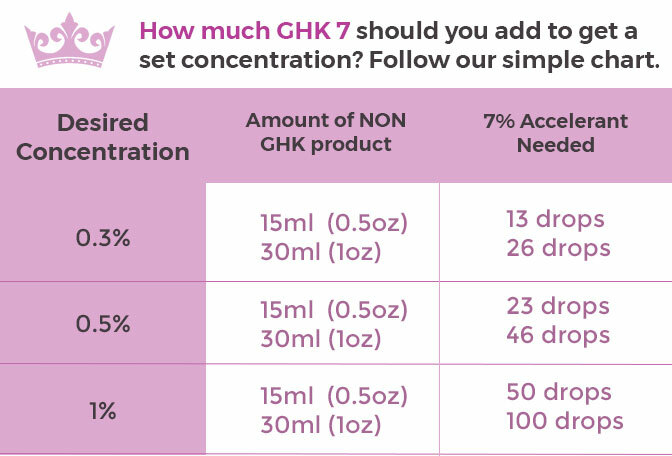 You must dilute the GHK-7 before use. Beware of Imitations. Dr. Pickart holdS the patent on GHK and 2nd generation copper peptides. He has tested knock-off brands and found them to be lacking and the percentage to be incorrectly stated for marketing purposes. This is a natural product. There are tiny, dark blue particles floating around in the mixture. These are perfectly normal pieces of sediment. Just brush off skin after applying with hands. We want you to understand how amazing copper is - not just for wrinkles. How about malignant melanoma cancer? Read this patent over and see how GHK suppresses cancer genes. GHK-Copper markedly improves skin's complexion, reduces appearance of wrinkles and helps restore a lifted and youthful look. Copper peptides utilize the skin's biochemical systems that remove the old, hard cells and damaged proteins and replace them with new skin and new proteins. Copper Peptide's work best on mature skin and show results within one to three months. All without the need for an expensive face lift. Remodeling is the key to regenerating tight, lifted, wrinkle free skin that will replace cosmetic and plastic surgery. Dr. Pickart's patented copper peptides ALTERNATED with hydroxy acids, and other anti-aging ingredients work amazingly well to amplify the removal of wrinkles while providing a lifted tightened complexion. Grab your favorite product (cream or serum without acid/C/Zinc in it) in either a 15ml (1/2oz or 30ml (1oz) bottle. Follow the chart and add the recommended drops of solution into your bottle or jar. Shake or mix well with a clean utensil and use as normal. You may also add this into other copper products to increase their strength.